It is so nice to see the sun again in our photos, this one is so different to last week’s Living Arrows photo! Even though I am fed up of it raining on the school run at least being able to get out at the weekend makes up for it. On Saturday I was meeting up with some family in Liverpool for lunch so I had the whole child free day ahead of me. I did a bit of shopping, mooched around Liverpool with my mum before meeting up with everyone for a lovely lunch and a few drinks. I wasn’t home late but all the boys were in bed by the time I’d made it back. As much as I feel like I need those days off, that time to myself is always greatly appreciated, I still feel ready to get back to reality. I like having that freedom when I can do as I please and I can talk to my Mum without having little ones shouting for Nanny over the top of our conversation. It is something I look forward to but at the same time it isn’t something I would want for ever and when that day is over I’m glad I get to come home to my boys. I feel refreshed for having a few hours where I don’t have to be Mummy but it also makes me realise how happy I am that I do get to be a Mum most of the time. On Sunday I woke up feeling a little delicate but the sun was shining and we couldn’t stay indoors. We took the boys out to the park for some fresh air and Lucas was in such a good mood he even let me take his photograph. He has always been so outgoing and tears round the playground without a care in the world. As soon as he was walking he was off without so much as a backward glance and he is still like that now, no fear. The twins watch him run round but always come back to hold our hand, eyeing up the playground until they are sure they want to try something out. Boo never quite plucked up the courage to try the slide despite seeing his brothers fly down it. They are all so different and it is amazing to watch the way they all see the world around them slightly differently. This is probably one of the happiest photos I’ve managed to get of Lucas for a while, I love how he looks so carefree and young. Forever my little adventurer. That is a lovely photo, so much enjoyment on his face. 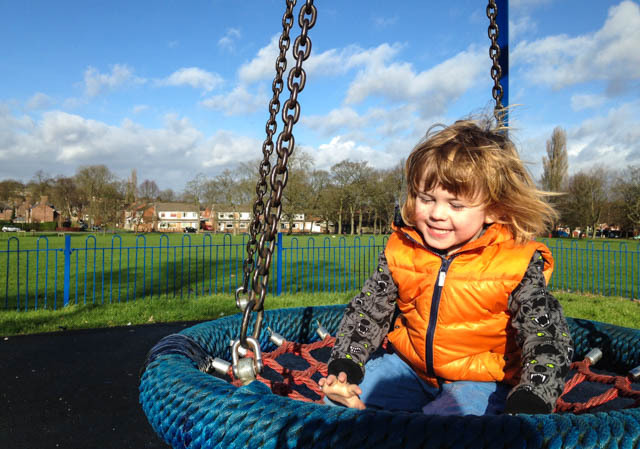 You can’t beat a park for getting outside and letting the children enjoy themselves while being active. I love this, he looks adorable!